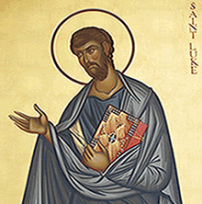 The Mission of Saint Luke Parish School of Religion is to help children deepen their understanding of the Catholic Faith and their relationship with God, our church and each other. The Parish School of Religion holds weekly classes for children in grades Pre-Kindergarten through Grade 12. We strive to give your children a base of knowledge about their faith to build upon for the rest of their lives and to teach them the value of studying and learning about their religion so they will be encouraged to explore their faith throughout their lives. The staff and volunteers in the Parish School of Religion are here to assist you, the parents, who are the primary teachers of your children. Children should be dropped off no earlier than 10 minutes before class, in the front entryway of the school on Sundays and the Religious Education Wing on Mondays. Children who have not been picked up, 15 minutes after the end of the session, will wait in the Religious Education Office for their parents. When Fairfax County Public Schools (FCPS) close or dismiss early due to inclement weather, Faith Formation classes are cancelled. When FCPS delay opening, classes are held as scheduled. The safety of your children is our primary concern. For an announcement, listen to WTOP-FM 103.5 MHz or check the WTOP web site, www.WTOP.com . You may also call the Religious Education Office at (703) 356-8419 for a recorded message announcing canceled classes. The Choristers meet on Thursdays from 4:30 to 5:15 pm in the church music room (above the kitchen in Flaherty Hall). We sing approximately once every 6 weeks at the Saturday 5:30 Mass. The Choristers are led by Benjamin Smedberg, with assistance from Paul Skevington. Please contact Paul Skevington 703-356-0670 or ﻿skevington@saintlukemclean.org﻿ for more info or to register.